The 1860 Census record for my 3rd great grandfather Michael Lowry is the oldest confirmed record I have of him. I also have an 1854 naturalization record for a Michael Lowry, but can’t confirm that it belongs to my Michael. In 1860, he was living as a coal miner in Carbon Township, Huntingdon County, Pennsylvania. Carbon Township is located in southern Huntingdon County, which itself is located in south central Pennsylvania. Unfortunately, I haven’t been able to locate any record prior to 1860 for Michael, which have to exist in some form as he is by this time already 30-years old and married with three children. 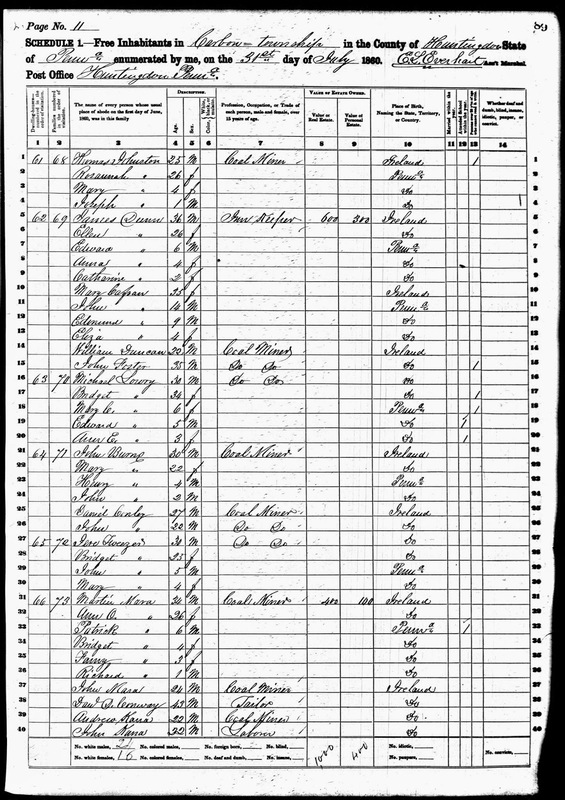 At least two additional children would be born to Michael and his wife Bridget, including my second great grandfather Michael Jr.
Michael household, 1860 U.S. census, Huntingdon County, Pennsylvania, population schedule, Carbon Township, page 327, dwelling 63, family 70; National Archives micropublication M653_1115. Page: 89; Image: 93. Ancestry.com; Link. Accessed 25 May 2014.